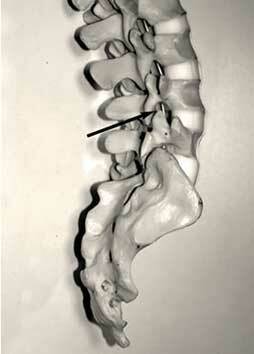 This photo demonstrates a nerve root block. The arrow demonstrates the direction that the needle would be inserted to reach the foramen through which the nerve root runs. When having this procedure performed, you would be lying on your stomach and the nerve block would be done from the back. (This is the section that explains the detail of the operation or procedure above and should be read in conjunction with the the section Your Back Operation). A lumbar nerve root block is performed for pain that is caused by an irritated nerve root. The aim of the procedure is to reduce the inflammation of the nerve root and also to block the pain impulse from travelling up the nerve to the brain. This will then bring partial or complete (but usually temporary) relief of the pain. The reason why your specialist performs this procedure is to first of all correctly diagnose whether this nerve root is causing the pain that is felt in the leg and secondly to bring temporary relief from the pain. It is the usual practice to use a mixture of long-acting local anaesthetic and steroids when injecting around the nerve root. The local anaesthetic solution brings instantaneous relief of the pain, if it is indeed the nerve root that is responsible for the pain and serves as a confirmation to your specialist that this is indeed the pathological level. The steroids reduce the inflammation and will provide longer-acting pain relief. This pain relief may be permanent in cases where the nerve compression is of a temporary nature. The nerve root block facilitates the normal recovery process of the nerve in cases where the compression is a temporary feature. This may be the case in a disc herniation. In other cases where the foramen through which the nerve runs (see the section Anatomy of the Spine), is permanently obstructed by a disc fragment or because of a bony narrowing, the relief will only be temporary. The block will, however, serve to determine the level at which an operation should take place. When undergoing this procedure, you will be lying on your stomach on bolsters or pillows. Your specialist will use an X-ray machine to guide the needle that is used to do the procedure with. The needle is placed directly into the foramen and a mixture of steroids and local anaesthetic is injected into the foramen and around the nerve. This procedure can also be performed on an out-patient basis under CT guidance by a radiologist. This procedure is usually performed as a day procedure and you will be allowed to go home soon after your procedure. It is incredibly important to get a lot of rest and exercise following your procedure. It is frequently useful to supplement your treatment with physiotherapy and local treatment such as massage therapy and chiropractic treatment. The nerve root block is both a test and a treatment. Neural stretch exercises are important to allow the nerve to mobilise freely in the foramen. Your physiotherapist will assist you with these.